A frame was made to match the cabin top exterior contour. Lot’s of scribing, sanding and testing but the result fits the shape very well. The frame was made first and the interior opening size determined the cutout size in the cabin top. The holes and recesses that you see around the frame are cut to accept a “Tee-Nut” - Once the cutout and contour were confirmed, the frame was clamped and bonded in place with 3-M 5200 and allowed to sit quietly for 2-3 days. The holes for the Tee-Nuts can now be drilled thru the cabin top and mate up with a very similar framework made for the interior that has matching holes. A 3.5” flat-head bolt will be inserted from the inside and when tightened will pull the Tee-Nut down to it’s final position (just below the “top surface” of the framework. Between the outside frame and the inside one the cabin top contour is “sandwiched” and the original shape is retained with minimal loss in overall stiffening. 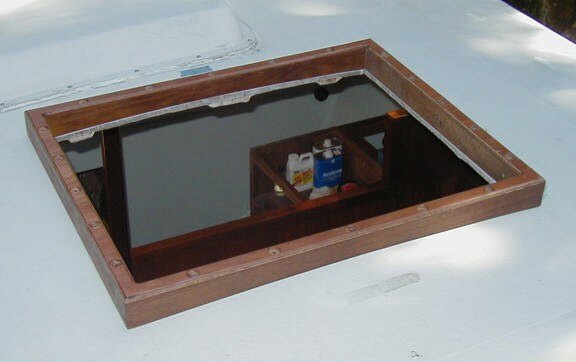 This frame is required to provide a watertight sealed base for the movable hatch cover that will rest on the top surface. That hatch will be hinged to permit opening and closing for air and will be latched tightly to restrict water intrusion from normal splashing or washing on the deck as well as being sealed and strong enough to resist “implosion” if the hull were inverted. A visual perspective of your boat in this position will have a significant impact on what you build and how. It’s a possibility we all hope would never happen, but one as well that we are able to prepare for and we should whenever possible.